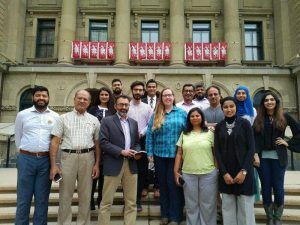 Members of Calgary’s Muslim communities meet with Labour Minister Christina Gray earlier this month. In an open letter to Premier Rachel Notley, the National Council of Canadian Muslims (NCCM) and the Alberta Muslim Public Affairs Council (AMPAC) are welcoming the government’s initiative. “We are pleased to have already participated in consultations with Minister of Education David Eggen and Minister of Labour Christina Gray on this topic, and look forward to assisting this critical strategy to ensure that all Albertans feel included as contributing members of the province,” reads the open letter. “Considering recent reports of ant-Muslim and anti-immigrant groups and militias forming in Alberta and already terrorizing certain mosque congregations, addressing anti-Muslim sentiment in particular has taken on new urgency. Eggen’s recommendations, based on community consultations, are expected in the fall.